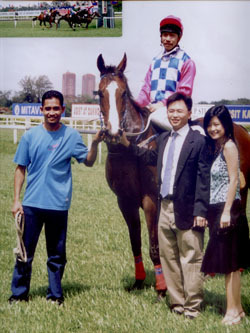 • 26 Jan 2007 - During “Joe and Jayzeeca”’s recent win, Mrs Chan Wing Seng joyfully recalled that they decided to use their friends’ names, “Joe” and “Jayzeeca”, to name this winning horse after they were stuck with what “good” name to call this horse. TOAST Members and Mrs Chan (2nd from left) with "Joe and Jayzeeca"
• 18 Jan 2007 - Mr Mark Chau, Senior Business Development Manager of Australian Trade Commission in Singapore, arranged a high tea meeting between TOAST (represented by Ms Constance Cheng, Ms Julia Ho and Mr Steven Cheow) and William Inglis & Son Ltd (represented by Mr Peter Heagney – Director, Simon Vivian - Auctioneer, and Mr Ian MacPherson) as well as Mr Shane McGrath - Sales & Marketing Manager of the breeder, Eliza Park. Both sides exchanged views about how to promote the sport and racing industry in both countries. • 14 Jan 2007 – TOAST is happy to convince TOAST member, Mr C.K. 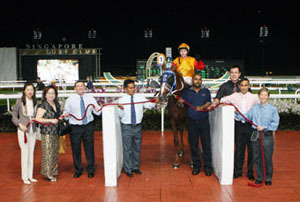 Ng, to take a winning photograph with his filly, “Field Princess” during her second win in Singapore. TOAST also stressed to Mr Ng that the concept of horse racing is not strictly gambling but fun and entertainment to enjoy as a sport. Mr C.K. 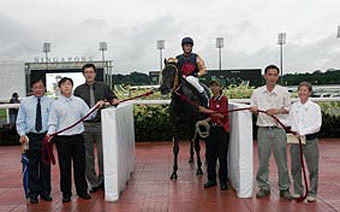 Ng (2nd from right) and Trainer Dr Yeoh (extreme left) leading in "Field Princess"
• 5 Jan 2007 – TOAST member, Mr Calvin Koh, had his wedding photos taken with “Prima Commands” (formerly owned by TOAST Trust No. 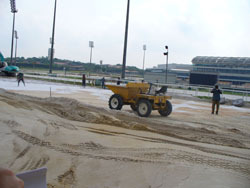 6), at Bukit Timah Saddle Club (BTSC) where the horse is given its second lease of life after being deleted from racing on 22 Aug 2006. 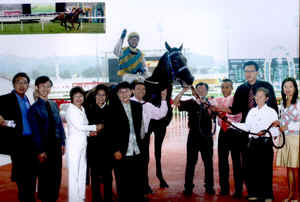 Mr Calvin Koh's Wedding Photo taken @ BTSC with "Prima Commands"
• 5 Jan 2007 – “Bolnisi Gold” had his third win in Singapore, when ridden by Jockey A. Calder, beat 11 other horses in a Class 4, 1100m on sand track. The tote dividends paid S$17.00 for a win and S$7.00 for a place respectively. "Bolnisi Gold" after his third win in Class 4 over 1100m on the sand track. • 31 Dec 2006 – The number of TOAST members now stands at 74. • 30 Nov 2006 – TOAST Trust No. 3, has been terminated. The horse, “All Ready”, was terminated on poor performance and will no longer race under the ownership of TOAST Trusts with effect from 30 Nov 2006. • 30 Nov 2006 – TOAST Trust No. 6 has been terminated. The horse, “Prima Commands”, was terminated on veterinary grounds and will no longer race under the ownership of TOAST Trusts with effect from 30 Nov 2006. 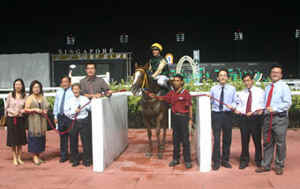 • 22 Nov 2006 – “Bolnisi Gold” had his second win in Singapore, when ridden by Jockey A. Calder, beat 10 other horses in a Class 4, 1100m on sand track. The tote dividends paid S$51.00 for a win and S$17.00 for a place respectively. Esther (5th from left) leading in "Big Jin" on 11 Nov 2006. • 25 Oct 2006 – TOAST member, Mr Lim Swee Ann, had another outsider winner when “Marwin Eighty Five”, a 7-year old ex-bleeder, clocked 1 min 15.1 secs over 1200m in a Penang Turf Club October Pro/Am Meeting’s race - MARA Open Handicap Division 2. The winning Tote dividends were RM 108.00 for a win and RM 23.00 for a place respectively. TOAST Member, Mr Lim Swee Ann, won a race in Penang. • 30 Sep 2006 – TOAST Trust No. 1, has been terminated. The 2 horses, “All Strike” and “Bronzino”, were terminated on veterinary grounds and poor performance respectively, and will no longer race under the ownership of TOAST Trusts with effect from 31 Jan 2006 and 30 Sep 2006 respectively. • 25 Aug 2006 – “Bolnisi Gold”, owned by TOAST Trust No. 7 and trained by Dr Yeoh Kheng Chye, had his first win when ridden by Jockey M Suhaimi beat 9 other horses in the Initiation 1100m on sand track. The tote dividends paid S$196.00 for a win and S$25.00 for a place respectively. 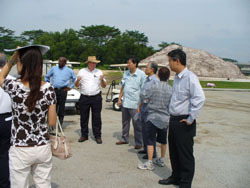 • 10 Aug 2006 - We were honored and pleased that SNTC, represented by Mr Soong Tze Ming, Vice President (Racing) and Mr Ian Trevethan, Senior Track Manager, hosted 10 TOAST members to a thorough site briefing and track inspection at SNTC. Ian (5th from right) briefing TOAST Members. SNTC Track Official Kumar (5th from left) briefing TOAST Members. Thatching work on the turf track. 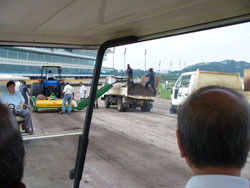 Resurfacing work on the fibresand track..
• 18 Jul 2006 - International Racehorse Transport & Insurance (IRT), which provides services and advice for the international movement, quarantine and insurance of all types and breeds of horses, was kind enough to extend an amount of AUD 10,000.00 in annual sponsorship for an equine course in Australia. No one took up this offer via TOAST. We hope that applicants will come forward for the next course. • 16 Jul 2006 - The 11th Emirates Singapore Derby has raised a record $100,000 for charity. To commemorate its 11th year of sponsoring one of Singapore's oldest races, Emirates also held fund-raising activities along with the race that includes silent auctions, contests and the sales of donation tables. For the record, "Our Falstaff" won the $1 million 11th Emirates Singapore Derby. 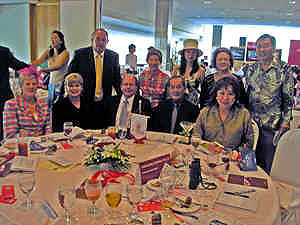 TOAST Members at the races on Emirates Derby day on 16 Jul 2006. 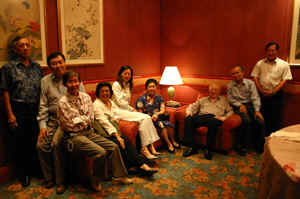 • 14 Jul 2006 - TOAST Committee Members met up with renowned horse-owner, Dato Tan Chin Nam, over lunch at Shang Palace, Shangri-La Hotel. Having bred and owned hundreds of “champion” racehorses in Australia, Dato Tan informally briefed TOAST on some of his ideas on how to improve the racing scene in Singapore, which he later on also shared directly with SNTC. TOAST Committee Members with Dato Tan (3rd from right), Datin Tan (4th from right), Mr Giam (extreme left), Dr Yeoh (extreme right), Mrs Yeoh (4th from left). 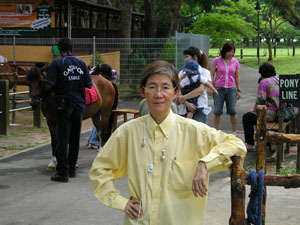 • 3 Jul 2006 - TOAST President, Ms Constance Cheng, visited Gallop Stable, the public riding establishment nestled in Pasir Ris Park, which first opened its doors to the public on 14 Apr 2006. It is a good initiative by the owners to promote public horse riding in Singapore by making horse riding and pony riding affordable for everyone and getting people interested in horses and nature. 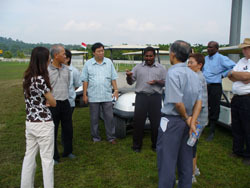 TOAST President, Ms Constance Cheng, visited Gallop Stable located @ Pasir Ris Park.